Steel cut oatmeal | Naturally. So, I first wanted to start off this post by saying thank you. Thank you for stopping by (even if it is for the first time) and viewing my little corner of the world. I am always happy when I can share recipes with so many people (also feel free to comment, I am always looking for adaptations for recipes!) Plus, my little corner keeps me kind of sane in a time when I feel like all I do is run around. Between ensembles, classes, and work my life consist of music, education, and then the two combined. Last semester I started to reconsider why I was in grad school and where I wanted to go with my life. Too often I think I still relinquish my decisions to people who I feel know better than me. That leaves me not following my heart. Granted, my mentor in college told me this was the path I was suppose to go down and I pretty much scoffed the whole idea off (luckily I finally wised up.) Two weeks in to this semester, and I know that I meant to be a teacher. I love learning about education. Tangent aside, there is one thing I love about being back in school. I get my mornings back. Working at the bakery had it upsides and downsides but I think the major downside pertained to getting up at 3:30 in the morning and working through breakfast. I may be a morning person but that is only the case when I can get up, make a pot of coffee, fix breakfast, and read the news. I like my peaceful mornings (which works because Mike is not (NOT) morning person.) I love breakfast. So, breakfast. I used to be one of those people who ignored breakfast. Now, breakfast has become my favorite meal and I have discovered I love oatmeal. Now, I am not talking that instant (pile of mush) instant oatmeal (I grew up on cream of wheat-talk about mush!) I am talking steel cut oats that give your teeth something to sink in to. Good bye mush, hello grains. There has been debate on whether steel cut are better than rolled (more fiber, etc..) but no one can pin point anything down. For a little more clarifications there was an article on the Livestrong site. My choice of topping? Strawberries, sucanat, and walnuts. Bring oats, water, and salt to a boil, reduce heat and let simmer for 10-15 minutes, stirring occasionally until oats are slightly tender. 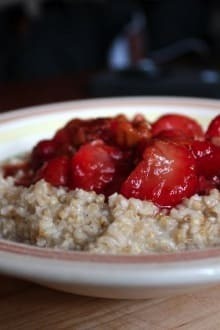 While oats are cooking, place strawberries in a small bowl (microwave if frozen until soft) and add walnuts and sugar. Mash so that there are still a few chunks of strawberries but sugar and walnuts are mixed in. 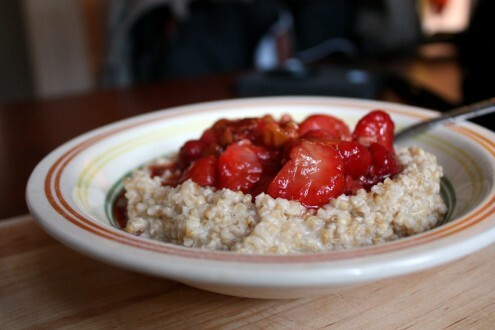 Once oatmeal is done, place in a bowl and top with strawberry mixture. This is my first time visiting your site–I love the design and photographs, it’s truly beautiful. 🙂 And I really feel I came at the right time, because I’m an oatmeal fanatic. For a long time I only ate steel-cut, but lately I’ve been getting back into rolled oats (not instant!). My fave combo is to cook the oats with half almond milk/half water and half a chopped apple. Once cooked, I add cinnamon, a little maple syrup, a little almond butter, and a spoonful of greek yogurt. HEAVEN! Thank you for stopping by and plus I think you are right- you did stop by at the right time! The combination sounds amazing (I have a slight obsession with almond butter and greek yogurt!) I will have to try that! That bowl looks scrumptious! Steel cut is my favorite. My first time visiting your site and I am hooked. I already plan to try the pumpkin steel cut oatmeal recipe in October. I also have to tell you today is my first time eating steel cut oatmeal and I wasn’t ready to try the 4 serving recipe on the package. I was directed to your recipe by Yummly.com. Awesome recipe for one plus, my daughter loved it! So, glad I found you. That’s great and thank you for the note!